Morning Quarters For Muster, Inspection and Instruction To have a thorough understanding of naval customs and traditions; To proactively integrate naval traditions, customs, and practices into decision making processes, training and daily leadership; and to consistently use naval history to demonstrate who we are as a service. Quarters, for Muster, Inspection and Instruction As it is officially known, is at the root of our heritage as well as a pillar of deck plate leadership. Holding quarters simply means taking the time to communicate face‐to‐face in a daily meeting to ensure all Sailors are where they are supposed to be, to conduct routine inspections, to recognize good performance, to impart information on the days events and other information relevant to the Sailors under your charge. Muster ensures all Sailors are accounted for from the previous day. Inspections ensure Sailors are in squared‐away uniforms and personal hygiene is up to standards ‐‐ to include haircuts and shaves if applicable. 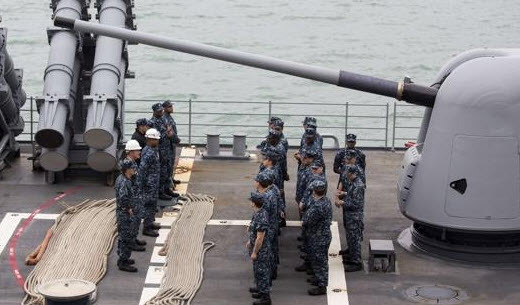 It also ensures Sailors are not incapacitated to perform the days duties and tasks. Instruction provides our Sailors to be informed and educated on all matters as well as breeds trust and respect. And, as the old cliché says, a Sailor who knows what’s going on is a better Sailor. If it’s true that we fight the way we train, the same can be true to say we’ll lead like we’ve been lead. The Chief’s and LPO’s presence at quarters is something that will be duplicated as Sailors move up in rank. This was the original complement, the Plank Holders. This covers November 16 through the 30th and December 1 through the 31st. It shows those reporting aboard and those leaving. Some reasons for leaving are spelled out, but others use a code. These were the people who came aboard ship in 1949. A couple of dates are visable, they are 01/01/49 amd 02/18/49, this was the official end of WWII Muster Lists. The rest of 1949 is held in the National Archives in St. Louis. The muster lists were just for enlisted men, until 1957 when they included officers.. It uses a code on most line entries.